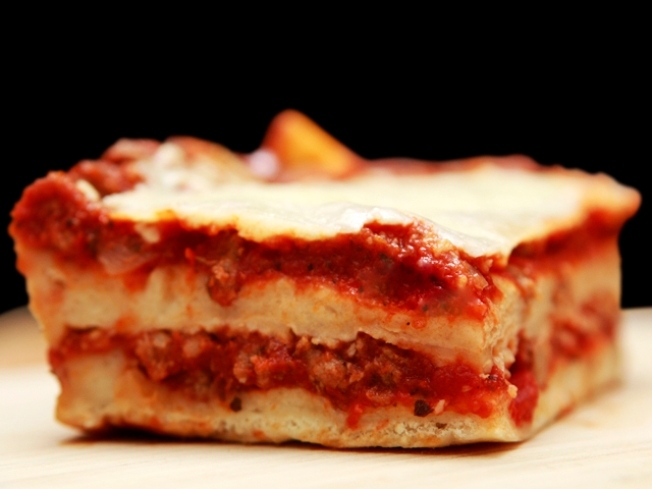 Alfonso's House of Lasagna is among the restaurants participating in Delivery Week. Forget Restaurant Week, foodiots and hungry residents of New York City, and prepare thy bellies for its long-lost distant cousin Delivery Week. Organized by the online food delivery service SeamlessWeb, Delivery Week will bring together around 100 restaurants in the city offering three-course, prix fixe meals, delivered straight to your sparsely decorated cubicle throughout the week of October 19th - 31st. Delivery lunches, long a staple for many Manhattan-by-day wage slaves, will be priced at $12.09, while dinners will top off at $20.09. Both will include an appetizer, entree, and dessert, followed by an open mind, freed from the burdens of the post-dinner caloric walk-off. Grubstreet's posted the full list of restaurants, which range from the Financial District to the Upper West Side and run the gamut from Alfonso's House of Lasagna to Big Nick's Burger & Pizza Joint, meaning this will indeed be primarily a Manhattan affair. And in part to hype the event and reward new fans, the event's organizers are choosing a handful of new Twitter followers a day to receive $15 and $25 delivery certificates on its Twitter account. For a map of the event's participating restaurants, click here, and stay tuned to deliveryweek.com.